Today's surprise comes from Sony. Take notes Nikon, this is what KeyMission could have been like*. The RX0, on its face, seems to be a GoPro Hero/KeyMission 170 competitor. But when you look closer you see that it has a 15.3mp 1" stacked sensor and a Zeiss wide-but-not-fisheye-wide lens (24mm equivalent f/4) up front, and no internal 4K or IS. Wait, what? Yep, the sensor wars have come to the action and small video camera world. This particular sensor has a lot going for it. It's a 20mp BSI Stacked, so basically the complexity of sensor that Sony Imaging created for the A9 brought to the 1" cameras. And that means that there are a bunch of little things that are interesting about it. For instance, 1/32000 electronic shutter that runs at up to 16 fps for stills with very little linear distortion (due to rolling shutter). It's not a global shutter, but like the A9, it appears to be very near to the capabilities of the slit shutter techniques used in mechanical shutters since the film days. It's unclear why the still output is 15.3mp, though. Meanwhile, the video side of the camera can capture up to 960 fps. There's a footnote with that: video quality declines as frame rate goes up. So at 240 fps, for instance, the output is basically 1080P level, but higher than that the quality declines. Also, the HDMI port enables uncompressed 8-bit 4:2:2 output at 4K (the camera only records internally at 1080P). Yes, there's S-Log, focus peaking, time code, and other videographer-friendly features. All this in a 3.9 ounce (110g) device that's 2.4 x 1.6 x 1.2" (59 x 40.5 x 29.8mm) in size. That can be submerged up to 33 feet (10m), can be dropped 6.5' (2m), and is crushproof to 440lb (200kg). As if that weren't enough, up to five RX0's can currently be controlled simultaneously via Sony's PlayMemories mobile app, and Sony is promising that they'll support more units and have a dedicated camera control box with a firmware update in January. The 24mm (equivalent) f/4 Zeiss lens is interesting. I've long wanted a less wide option for my remote video cams that have to fit into small places, and this is it. The f/4 aspect is a bit disappointing, though. Moreover, there's no Steady Shot. I thought at first that the 15.3mp effective pixels might have been because of some form of electronic IS, but apparently not. Mounting is a bit suspect with the base camera as it's just a regular tripod socket at the bottom, though Sony has announced an optional VCT-CGR1 cage that has 35 mounting holes on four faces, which should address the kinds of mounting we videographers want to do. The actual camera is quite tiny, so a small cage still keeps it on the small size. As usual with Sony's recent products, there's a lot of footnoting you have to pay attention to (e.g. the 4K ability is only via the HDMI connector as far as I can tell, and no sound is recorded in slow motion). But overall, the RX0 appears to be a real powerhouse of a camera for drones, B-roll, bullet time, and even some types of action camera use. For more on the RX0, see Sony's RX0 brochure, which explains all (at least all they care to explain). Price is US$700, with availability expected in September. GoPro has their work cut out for them with the next Hero. GoPro will still have the advantage of internal 4K recording and a near fisheye lens, but that's about where the advantages might end against this new entrant if GoPro hasn't been truly innovating. As it is, Nikon's KeyMission 170 pretty much matched the Hero5 head to head, plus there's a ton of GoPro Hero 4 clones now selling for under US$100. Which brings me back to my usual point: workflow. If Sony has really done the multi-camera control well, that alone will attract a lot of folk to this little box. Especially if we can get to bullet-time controlled from one device, which seems to be what Sony is promising. 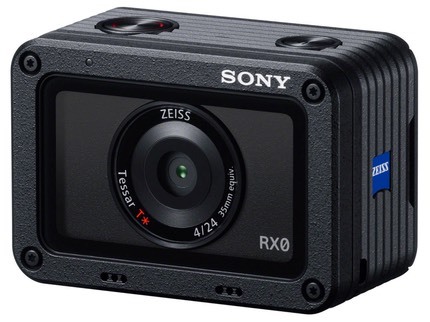 What's amusing is to watch all the Sony fan boys poo-pooing this camera (mostly because of lack of internal 4K). But I'm quite interested in this camera, as it has a number of aspects to it that I'm not getting from current competition. When we rig GoPros to the safari vehicle, for instance, we get lots of 170° views, which means either you have to have the camera right up near the subject (e.g. driver), or settle for lots of small things in the frame (e.g. animals).